Her current owner, who has owned her since 2004, says the boat and engine are in good condition. She starts, runs and goes very well. He has indicated that he has taken very good care of her and when you pull the oil dip stick you will see a gold and clear color, always!! New Oil, New Oil Filter & Tune Up Every Year. With her 60 gal fuel tank, the current owner says he has never used all the fuel in 1 season and he estimates that the hours of use on the engine since the re-build done in 2001 are approximately 150-200 hours. The previous owner before him rarely took the boat out, was not comfortable (scared) and used it as a condo. Hence the low hours. The water holding tank needs replacement and the owner says $100.00 should take care of it. No receipts available on the engine re-build or maintenance, owner performed tune ups,oil changes and general service himself. Owner has the original Chris-Craft Owners Manual. Stock #067885 FULLY ENCLOSED CANVAS and RE-BUILT ENGINE w/ONLY 200 HOURS!!!! 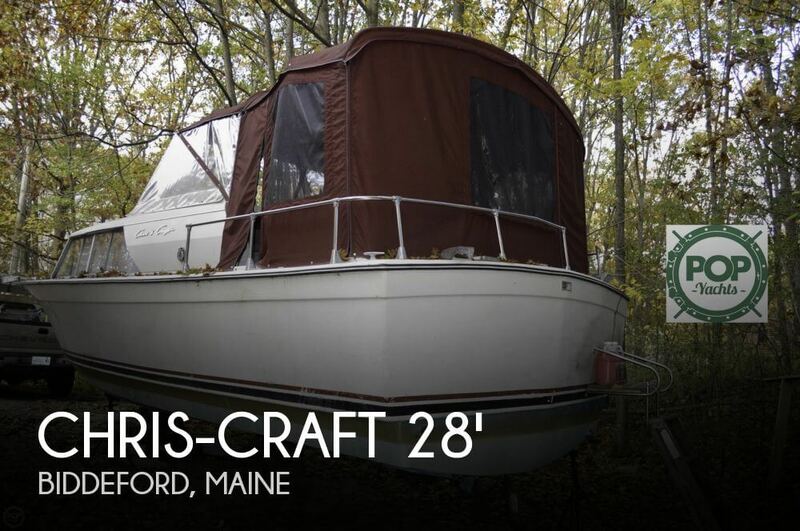 If you are in the market for an antique and classic boat, look no further than this 1969 Chris-Craft 27 Commander, just reduced to $8,000 (offers encouraged). 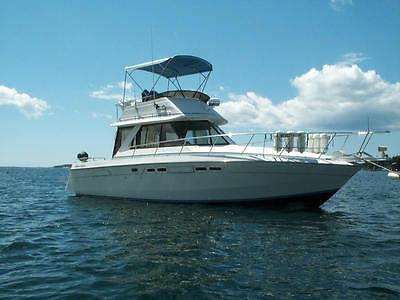 This boat is located in Biddeford, Maine and is in great condition. The engine has only 200 hours. VERY GOOD CONDITION, 1987, CHRIS-CRAFT AMEROSPORT 333,FLY-BRIDGE, FULLY EQUIPPED, RADIO,FURANO 18M. RADAR, GARMIN GPS, DEPT SOUNDER, AUTO-PILOT.10 GAL. HOT WATER, TANK 60 GAL COLD WATER TANK WINDLASS, FORTRESS ALUMINUM ANCHOR, Dinghy brackets included. Refrigerator-freezer, MICROWAVE OVEN AND MORE. 6 Jack stands includedBOAT IN WALES,MainePOWERED BY TWIN 454 CRUSADERS FRESH WATER COOLED ENGINES, 250 GAL. FUEL TANK. STRAIGHT SHAFTS, NEW ECONOMICAL EDELBROCK CARBURETORS, FUEL PUMPS. ELECTRIC HEAD, DUAL HYDRAULIC STEERING, ENCLOSED CANVAS FLY-BRIDGE. AC-DC CONTROL CIRCUIT BREAKER.. Asking $ 18,500.00 . MOORING IN ROCKLAND INCLUDED.